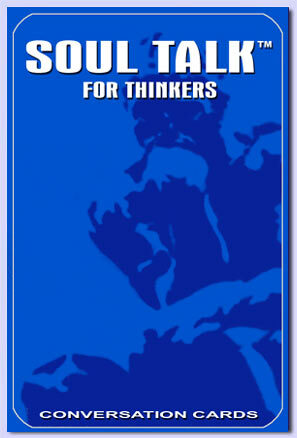 Based on the success of quick dialogue among thousands of students and professionals playing these cards, Soul Talk for Thinkers is a simple, yet powerful tool designed for you to spark discussions among your groups. Inside are 40 cards each with a meaningful quote and a thought-provoking question. Use anywhere, anytime: on dates, at school, church, meetings, parties -- anywhere groups gather. And most of all, have fun learning about yourself and others. If you would like more information, please e-mail Karen Early at karen@imaginomics.org.